In case you missed it, we’ve reviewed all Zenfone 3 Series mobiles starting from the flagship Zenfone 3, followed by Zenfone 3 Laser, Zenfone 3 Max and the Zenfone 3S Max. Every time we do a review our review period is like a week. 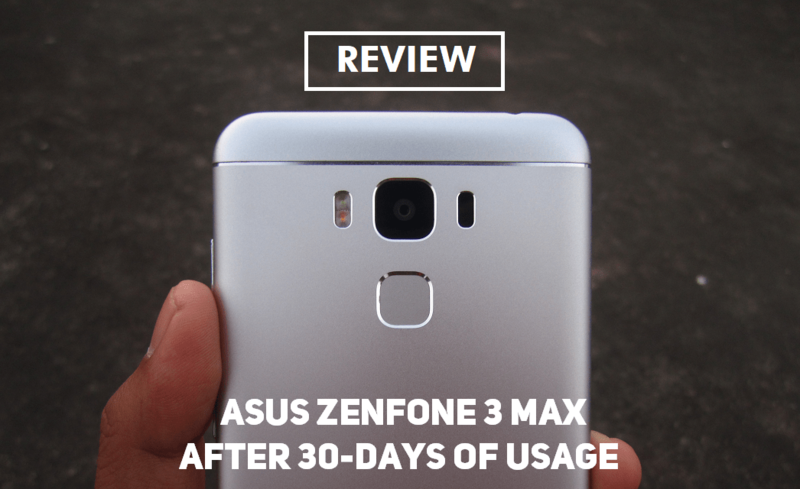 This time we’ve tried doing a long term review of Asus Zenfone 3 Max, used it for more than 30 days. Let us move further what we’ve found out in this long-term review of Asus Zenfone 3 Max. Asus Zenfone 3 Max version we reviewed is 5.5-inch version (ZC553KL) which has differences in specifications with the 5.2-inch version (ZC5520KL). In this review, I want to discuss the overall experience with the device. Asus Zenfone 3 Max’s selling point is its big battery of 5000 mAh. I’ve used the phone as a secondary device for a couple of days. Used it for calling and used Apps like WhatsApp, Youtube, and a little browsing. I’d like to start with the cons and slowly move towards pros. I’ve done a lot of WhatsApp video calls during the test period, realized that the quality of the microphone is pathetic! The receiver will surely face trouble attending the call. Also, the sound of the speaker was mediocre and may not be audible at outdoors (even with the given“Outdoor Mode” ). Yeah, there is an option called outdoor mode which is supposed to boost the sound out of speakers. It wasn’t useful anyway. Standard call reception is just fine as, during Video calls, microphone needs to take in all the sounds around it and it is not the same case with regular calling. During my review time, I’ve faced a weird incident. Was watching a YouTube Video and suddenly the whole screen turned green with a loud beep sound (The speakers never gave such strong output during normal usage ????). The phone was in this condition like for a minute. I was afraid if it’s going to blast off! However, I dared and made an attempt to turn it off by pressing the Power button. I took like a while to turn off; it wasn’t instant. This happened twice during my review period. I couldn’t record during the first time as I freaked out and during the second time it was quick, lasted like 10 seconds and rebooted on its own. And, umm… Guess there isn’t any need to talk about the Camera, it doesn’t change with time period anyway, isn’t it? I recommend you to refer to the original review of Zenfone 3 Max for this section. Talking about the battery, it consistently gave me more than 8 hours of S.O.T as I did not use the phone for gaming or heavy usage, just Calls-YouTube-WhatsApp-WhatsApp Video Calling. Easily managed for 2 days. So, if you’re a not so much of a phone addict, you can easily use the phone for 2 days with no effort. The performance of the phone is good with mediocre usage, with heavy usage phone warms slightly and lags sometimes. Graphics Processing is average while playing medium to heavy games. Summing up and covering a few points, firstly the phone weighs relatively higher than other phones thanks to the 4100mAh battery, you can expect easy damage to the phone if it slips down. Android O was already released and the Asus Zenfone 3 Max wasn’t even on Android Nougat, it runs on Android Marshmallow and isn’t provided with the update. The fingerprint sensor is fast and excellent. I recommend reading the Zenfone 3 Max review for in-depth analysis of each department. With Zenfone 4 series coming soon, you must decide to buy this phone or to wait till the flagship family launches to India. However, the bad pricing of Rs.17999/ Rs.16,999/- ( Wow! Such great discount ) for this device doesn’t make me recommend this device. If it is priced somewhere near Rs.10k – Rs.12k you can blindly buy this phone, as there is hardly anything to point on the phone except the pricing. I expect the Zenfone 4 series to be priced better than the Zenfone 3 series.